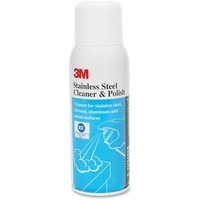 Stainless Steel Cleaner and Polish is ideal for stainless steel, chrome, laminated plastics and aluminum surfaces. With a high gloss formula, it cleans and polishes in one step with no streaks or buildup, resists fingerprints and masks surface blemishes. Use on stainless steel, chrome, architectural aluminum and other interior metal surfaces. Spraying with this aerosol can leaves a pleasant citrus fragrance. Cleaner meets the requirements of the NSF Nonfood Compounds Registration Program for metal cleaners and polishes for nonfood contact surfaces. It is not intended as a glass cleaner.